The Show MDX command displays the MDX query generated as a result of design, or prepared manually by the user, in a special window. If the query contains more than two axes it can be converted into a typical query containing two axes (rows and columns). Often it is convenient for debugging the query. For example, Microsoft Management Studio does not show the MDX query result if the query has more than two axes. Then it is necessary to modify the query manually. The MDX query can be copied to the clipboard. Figure 1. 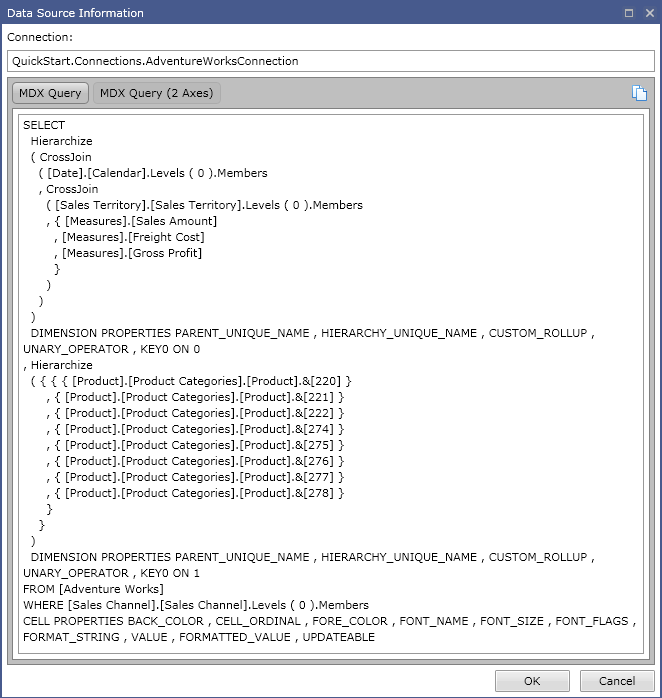 MDX query view window. In addition to this, it is possible to pass parameters to an MDX query when incorporating the pivot grid visual element in the application forms. The parameters must be enclosed between the <%%> symbols. Depending on their values, the initial query will be parsed, and a result will be obtained. The drill down commands take into account the MDX query parameters. Figure 2. MDX query with parameters.